سلیمانی, ابراهیم, اکبرپور, طاهره, جعفرزاده, محمد. (1396). سنتز H4- بنزو- [4، 1][b] اکسازین-2-آمین ها طی واکنش چند جزیی بنزیل الکل، 2-آمینو فنول و ایزوسیانید با استفاده از اوره هیدروژن پراکسید در حضور کاتالیست منیزیم برمید. 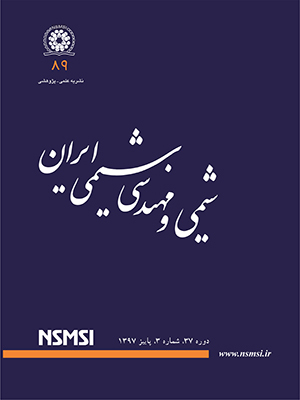 نشریه شیمی و مهندسی شیمی ایران, 36(4), 65-70. ابراهیم سلیمانی; طاهره اکبرپور; محمد جعفرزاده. "سنتز H4- بنزو- [4، 1][b] اکسازین-2-آمین ها طی واکنش چند جزیی بنزیل الکل، 2-آمینو فنول و ایزوسیانید با استفاده از اوره هیدروژن پراکسید در حضور کاتالیست منیزیم برمید". نشریه شیمی و مهندسی شیمی ایران, 36, 4, 1396, 65-70. سلیمانی, ابراهیم, اکبرپور, طاهره, جعفرزاده, محمد. (1396). 'سنتز H4- بنزو- [4، 1][b] اکسازین-2-آمین ها طی واکنش چند جزیی بنزیل الکل، 2-آمینو فنول و ایزوسیانید با استفاده از اوره هیدروژن پراکسید در حضور کاتالیست منیزیم برمید', نشریه شیمی و مهندسی شیمی ایران, 36(4), pp. 65-70. سلیمانی, ابراهیم, اکبرپور, طاهره, جعفرزاده, محمد. سنتز H4- بنزو- [4، 1][b] اکسازین-2-آمین ها طی واکنش چند جزیی بنزیل الکل، 2-آمینو فنول و ایزوسیانید با استفاده از اوره هیدروژن پراکسید در حضور کاتالیست منیزیم برمید. نشریه شیمی و مهندسی شیمی ایران, 1396; 36(4): 65-70. یک واکنش سه جزیی بین مشتق­ های بنزیل الکل، 2-آمینو فنول و ایزوسیانید برای تهیه مشتق­ های H4- بنزو-]4، 1[[b]اکسازین-2-آمین ها گزارش شده است. در این واکنش مشتق­ های بنزآلدهید از بنزیل الکل ­ها طی فرایند اکسایش با UHP در حضور کاتالیست 2MgBrبه­صورت همزمان تولید می شوند. راندمان بالا و شرایط انجام واکنش و جداسازی آسان فراورده­ ها از برتری­ های این روش می باشد. Hudlicky T., Luna H., Price J.D., Rulin F., Microbial Oxidation of Chloroaromatics in the Enantiodivergent Synthesis of Pyrrolizidine Alkaloids: Trihydroxyheliotridanes, J. Org.Chem., 55: 4683-4687 (1990). Chaudhari, M.P., Sawant, S.B., Kinetics of Heterogeneous Oxidation of Benzyl Alcohol with Hydrogen peroxide, Chem. Eng. J., 106: 111-118 (2005). March J., “Advanced Organic Chemistry: Reactions, Mechanisms, and Structure”, John Wiley & Sons, NewYork, (1992). Marko I.E., Giles P.R., Tsukazaki M., Brown S.M., Urch C.J., Copper-Catalyzed Oxidation of Alcohols to Aldehydes and Ketones: An Efficient, Aerobic Alternative, Science, 274: 2044-2046 (1996). Sheldon R.A., Kochi J.K., “Metal-Catalyzed Oxidations of Organic Compounds”, Academic Press, New York, (1981). Damavandi J., Karami A.B., Zolfigol M.A., Selective Oxidation of N-Alkyl Imines to Oxaziridines Using UHP/Maleic Anhydride System, Synlett, 933: (2002). Zhu J., Bienaymé H., “Multicomponent Reactions”, Wiley-VCH: Weinheim, (2005). Domling A., Recent Developments in Isocyanide Based Multicomponent Reactions in Applied Chemistry, Chem. Rev., 106: 17-89 (2006). Ugi I., Werner B., Dömling A., The Chemistry of Isocyanides, their MultiComponent Reactions and their Libraries, Molecules, 8: 53-66 (2003). تیموری، محمد باقر؛ باژرنگ، ریحانه؛ به دام اندازی حدواسط هویزگن به دست آمده از واکنش ایزوسیانیدها با آلکین‌های فعال: روشی کارآمد برای سنتز ترکیبات آلی نوین، نشریهشیمیومهندسیشیمیایران، (3) 29: 1 تا 28 (1389). Fringuelli R., Pietrella D., Schiaffella F., Guarrac I.A., Perito S., Bistoni F., Vecchiarelli A., Anti-Candida Albicans Properties of Novel Benzoxazine Analogues, Bioorg. Med. Chem., 10: 1681-1686 (2002). Macchiarulo A., Costantino G., Fringuelli F., Vecchiarelli A., Schiaffella F., Fringuelli, R., 1,4-Benzothiazine and 1,4-Benzoxazine Imidazole Derivatives with Antifungal Activity: A Docking Study, Bioorg. Med. Chem., 10: 3415-3423 (2002). Adams N.D., Darcy M.G., Dhanak D., Duffy K.J., Fitch D.M., Knight S.D., Newlander K.A., Shaw A.N., Int. Patent, WO 2006113432, (2006). Soleimani E., Zainali M.,Isocyanide-Based Multicomponent Reactions: Synthesis of Alkyl-2-(1-(alkylcarbamoyl)-2,2-dicyanoethyl)benzoate and Isochromeno[3,4-b]pyrrole Derivatives, J. Org. Chem.,76: 10306-10311 (2011). Soleimani E., Zainali M., Samadi S., Isocyanide-Based Multicomponent Reactions: Synthesis of 3,3-dicyano-N-alkyl-2-arylpropanamide Derivatives, Tetrahedron Lett., 52: 4186-4188 (2011). Soleimani E., Zainali M., Ghasemi N., Notash B., Isocyanide-based Multicomponent Reactions: Synthesis of 2-(1-(alkylcarbamoyl)-2,2-dicyanoethyl)-N-alkylbenzamide and 1,7-diazaspiro[4,4]nonane-2,4-dione Derivatives, Tetrahedron, 69: 9832- (2013). Soleimani E., Ghorbani S., Ghasempour H.R., Novel Isocyanide-Based Three-Component Reaction: A Facile Synthesis of Substituted 1H-chromeno[2,3-d]pyrimidine-5-carboxamides, Tetrahedron, 69: 8511-8515 (2013). Soleimani E., Khodaei M.M., Taheri Kal Koshvandi A., Three-Component, One-Pot Synthesis of Benzo[b][1,4]oxazines in Ionic Liquid 1-Butyl-3-methylimidazolium Bromide, Synth. Commun. 42: 1367-1371 (2012). Heravi M.M., Baghernejad B., Oskooie H.A., A Novel Three-Component Reaction for the Synthesis of 3-aryl-4H-benzo [1,4] Oxazin-2-amine, Mol. Divers., 13: 395-398 (2009). Wasserscheid P., Keim W., Ionic Liquids—New “Solutions” for Transition Metal Catalysis, Angew. Chem. Int. Ed., 39: 3772-3789 (2000). Welton T., Ionic Liquids in Catalysis, Coord. Chem. Rev., 248: 2459-2477 (2004). Sheldon R.A., Madeira R., Lau R.M., Sorgedrager M.J., van Rantwijk F., Seddon K.R., Biocatalysis in ionic liquids, Green. Chem., 4: 147-151 (2002).